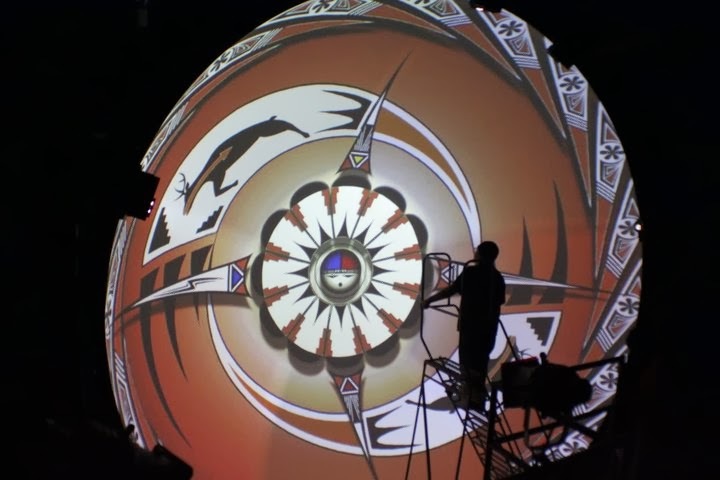 This fall, Ethan Bach will teach Digital Dome Production I at the Digital Dome at IAIA. Get in on the cutting-edge of this new technology while learning how to use the DigitalSky software, create panorama and fisheye images, and learn the history, present, and future of the digital dome. This course requires a willingness to experiment, research, take risk and break new ground. From the basics of how to place a still image on the dome to exploring and experimenting with storytelling, installation, and art. Students can work with the dome in various positions utilizing its unique ability to articulate. A public showing of work is required as part of the final project. The 1 credit colloquial that ran this spring semester was a tremendous hit. Over 15 students took the course and walked away with basic concepts in dome production.This fall, Bach will revisit and build on these concepts in a full 3 credit course in digital dome production. The preliminary course outline can be found below. Non-degree seeking students can sign up for the course beginning on May 16. Instructor permission is required, so make sure to send email to ebach@iaia.edu prior to attempting to register or if you have questions. For information on how to register visit http://www.iaia.edu/ or call 505-424-2300. NMAD351 Digital Dome Production I Tuesdays/Thursdays 9:30am – 12pm. Fall 2011 runs August 22 – December 9. There is still plenty of room, as many IAIA students wait until after pre-reg to register. Please feel free to invite friends and colleges to this course. Other required readings will be provided by the instructor. Also, the library has a collection of materials related to Native American storytelling traditions, both general and tribally specific. There is also a thorough collection of Native American, First Nations and Alaska Native history materials in multiple formats, which can be used as background research and creative inspiration. Films made by Native filmmakers are also actively collected and available for use by students.